Welcome to my 2nd installment of my The Sandman Readthrough series which comes out every Wednesday. This is how it will work. You read The Sandman issue 2 and then you come here to talk about it! If you have not read this series by Neil Gaiman you are crazy. I am hoping this series might get some people interested in non-superhero comics. This issue started off very interesting when we join two older brothers one who is mean (Cain) to the other one (Abel). Cain has a gift for Abel, but Abel is scared to open it since he knows his brother is usually violent. They live in a mysterious house of sorcery then there is a huge knock at the door. It turns out to be Cain’s gargoyle who is named, Gregory. What Gregory is holding in his mouth is the knocked out Sandman. The two take him in and feed him. The Prince of Dreams wakes up and explains that he has traveled here for his papers he lost before his imprisonment. Some magical papers (go with it). Cain plays dumb, but Abel that the coward he is gave out the two away. Sandman left after he gained his papers back . He went to the realm of Dreams called Dreamworld. His home. He sees the place and it’s all destroyed as the absence of Dream affected it. Next, Dream travels to the 3-in-1 to seek answers where he can find his other objects that were stolen from him before his imprisonment by the cult. 3-in-1 are a group of Three Witches who tell fortune. They are basically an Oracle who work as one. They constantly change faces and turn into one another (it sounds weird but if you read the comic you’ll know what I mean). They tell him that his Pouch of Sand was last seen with John Constantine. Constantine?! What?! He’s in this? Awesome!!! Next, they(she) tell him that his weird looking head alien gear is held by a demon in hell. That will be an interesting issue to see. Then the last one we find out that his Dreamstone is held by…. the freaking Justice League!!!! I didn’t know the Sandman was part of the DC Universe!Dream will now be on a hunt for his magical objects! I can’t wait to see this development happen. Adding him to the DCU will add new dynamic we have never seen before. Dream will maybe confront with Batman!? Who knows!?! At the end we go back to Cain and Abel. Abel finally opened his present and it turned to be a golden baby gargoyle! 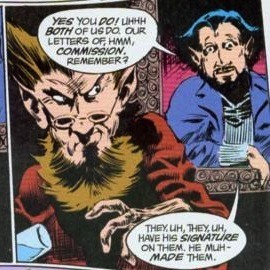 Abel wanted to call him Irving, but Cain got mad at him and hit hard because all gargoyles should have a name that start with a letter G. I don’t know the purpose of these two characters. All they do is just live in some House of Mystery. I feel like Neil Gaiman has a plan for them so I won’t judge their purpose just yet. Maybe Abel will turn against his bother and be a threat to Cain and Dream in the future? I should also mention that I refer to the main character as Dream or Sandman. His other name is Morpheus so don’t be surprised if I refer to the guy as Morpheus. Guys! I can’t wait to see what will happen next! This issue is a great set-up for what’s to come.I am just excited to read Morpheus try to regain his objects back. He needs them to regain his strength and power. Alright! See you next Wednesday guys! John Constantine will join us on this next adventure so get excited. Make sure to pick up issue 3 by next Wednesday. Our adventure begins!